home Scholarly Literature (Journals, Books, Reports) Managing microbial migrations in drinking water systems. Managing microbial migrations in drinking water systems. Every day, diverse microbial communities with cell levels of 106-108 cells/liter migrate from drinking water treatment plants through a complex network of pipes in drinking water distribution systems and into our built environment. Managing this mass migration is critical from multiple perspectives. Some of these microorganisms can make consumers ill, some can contribute to pipe damage by corrosion, and some can even affect the aesthetic quality of water (e.g. water color, odor, turbidity). The current approach for managing microbial water quality involves a significant amount of prospective sampling in an effort to detect potential contamination events and then implementing rapid mitigative strategies to minimize impact if a contamination risk is detected. Though effective, this approach is inefficient. For example, the numbers of samples collected for prospective monitoring are typically two to four orders of magnitude higher than the probability of a microbial contamination event being detected (assuming compliance rate of >99%). 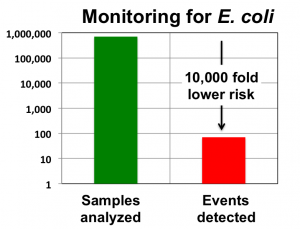 The figure to the right shows a comparison of the number of samples collected in the UK in 2012 for E. coli monitoring (green bar) and the number of actual events detected (red). Another downside of this approach is that it is focused on event detection rather than on prevention. An alternative to prospective monitoring could be predicting microbial contamination events. Specifically, if water utilities could predict time frames and locations where risk of contamination is high, they could deploy their resources in a more informed manner to prevent contamination events from occurring in the first place. In our recent mBio paper , we detected six important features of bacterial community dynamics in a drinking water system in Ann Arbor, Michigan — features that could be effectively tied together to develop such an Event Prediction and Correction Framework. Specifically, our long-term vision is that someday by monitoring the microbial community at the drinking water treatment plant, operators will be able to predict microbial community composition at any location in the distribution system over operationally relevant time-scale, as illustrated in the figure below. So what are these key features? First, we showed that bacterial community in the distribution system is highly similar to the community leaving the drinking water treatment plant (~80% shared bacterial operational taxonomic units (OTU)). Second, the richness of the bacterial community (i.e., how many different OTUs) is strongly correlated with both temperature and the composition of the source water — with colder months showing lower richness as compared to the warmer months. Third, we detected a strong correlation between the change in drinking water bacterial community and the distance travelled by the water along a linear flow path in the drinking water distribution system. Fourth, the bacterial community changes seasonally and shows annual reproducibility (i.e., bacterial communities are highly similar one year apart). Fifth, we showed that these seasonal changes are driven by specific bacterial clusters — a cluster that dominates in the winter and one that dominates in the summer, with a third cluster showing high level of stability throughout the sampling campaign. And finally, we showed that the frequency with which a bacterial OTU is detected in the drinking water system is a function of its mean relative abundance and could be modeled using previously published occupancy-abundance models. Specifically, OTUs that exhibit higher abundance will be detected in many more sampling locations and low abundance OTUs will be detected in fewer places. So how can these six features be used to develop a predictive framework? We have some ideas on how to do this as outlined in the last portion of the discussion section of the paper, but we need much more data to first confirm which of the above features are generic enough to be valid across multiple drinking water systems. Additionally, these features have good connections to ecological theory (e.g., patterns of frequency-abundance as described by the neutral theory, distance decay, dispersal). Moving forward, our focus is not only going to be on wide-scale testing of the robustness of the features described in our study, but also integrating them with ecological theory (watch out for our upcoming paper in PLoS One, Schroeder et al. Probabilistic Models for Dynamics of Dispersing Bacterial Communities). Grounding these predictive efforts in theory will be critical towards ensuring that our ecological fascination with the drinking water microbiome has a positive impact on day-to-day operations of drinking water utilities and their customers. Ameet Pinto is a researcher at the University of Glasgow studying the microbiology of drinking water.